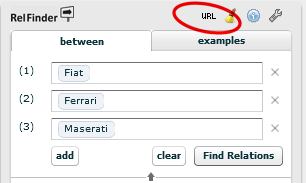 Click on the 'URL' button to get the URL of the search result and save it to the clipboard. Click on the 'URL' button to get the URL of the current search result and save it to the clipboard. You can use this URL to directly link to a result. obj1, obj2, ..., objN: The URIs of the objects between which relationships shall be searched within the dataset. name: The name of the dataset which will be displayed in the settings menu. abbreviation: An abbreviation (or ID) for the dataset configuration. This can be used to load the RelFinder directly with this specific configuration. (For instance, demo.swf?id=lmdb loads the RelFinder with the 'Linked Movie Data Base' configuration by default). description: A description of the dataset which will be displayed in the settings menu. endpointURI: The URL of the SPARQL endpoint. The RelFinder uses this URL + '/sparql?' to query the endpoint. dontAppendSPARQL: Prevents the RelFinder from appending '/sparql?' to the defined endpointURI. defaultGraphURI: The URI of the default graph which should be used for the search (usually not necessary). isVirtuoso: If the SPARQL server is a "Virtuoso" server this value can be set to 'true'. The RelFinder will then use Virtuoso specific commands for an improved autocompletion. If you are not sure better set this value to 'false'. That should always work. useProxy: If the SPARQL server has NO crossdomain.xml set this value to 'true' in order to forward all queries to the defined proxy server. method: HTTP method for SPARQL requests. Possible values are POST and GET. autocompleteURIs: URIs of properties that should be used for autocompletion and disambiguation features. (Usually, RDF label works fine - http://www.w3.org/2000/01/rdf-schema#label). autocompleteLanguage: The language code that will be used for autocomplete (e.g., 'en' for English or 'de' for German). A language code is usually not necessary. ignoredProperties: URIs of properties that should not be included in the relationship search. maxRelationLegth: The maximum length of relationships that the RelFinder searches for (a value between 1 and 3 is recommended). Note that all variables have to be Base64 encoded. &description=Linked Data version of Wikipedia.